It’s more than a little ironic that Malcolm D. Lee’s “Girls Trip” turns on the mantra You Can Have It All being revealed as phony since the movie itself is sort of trying to have it all by giving would-be gravity to an otherwise uproariously irreverent comedy. And even if there is something ennobling about “Girls Trip’s” trying to rehabilitate the antiquated movie notion that women can only find happiness in the arms of a man, you nevertheless wish an editor had left red checkmarks all over the overlong last half hour. But, whatever. 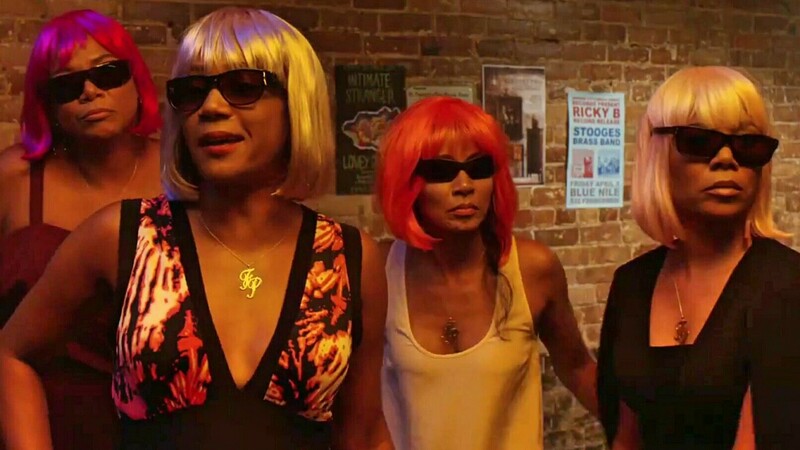 If Lee’s film wheezes in the stretch run, so much of it still pulses with an awesome life force as its four main characters – the self-proclaimed Flossy Posse – take New Orleans by storm for the Essence Festival. Upon arrival, in fact, Lee unleashes a montage that, despite hitting a few Crescent City hotspots, is less about establishing locale, or even connecting one scene to another, then its simple buoyant spirit, one representative of “Girls Trip” at its best, emblemized in the song The Soul Rebels’ cover of Bill Withers’s “Lovely Day” laid out over it. “Girls Trip” begins with a flashback as a means to introduce us to the Flossy Posse before entering the present day for the Where Are They Now? introductions. Ryan (Regina Hall) has successfully turned her and her husband Stewart’s (Mike Colter) lifestyle into a brand. Sasha (Queen Latifah) is a gossip columnist fallen on hard times as predictably evinced by the litany of late bills spread across her counter while Lisa (Jada Pinkett Smith) is a single mom with a pitiful dating life as predictably evinced by the scrubs she plans to wear on the plane to New Orleans. This is all standard operating procedure. But leave it to the film’s breakout star, Tiffany Haddish as Dina, to rip procedure to shreds, introduced by deliberately failing to pay attention as she gets fired, walking out of the room like she’s still got the job, essentially turning her back a conventional character introduction with such breezy defiance you wish the other three women had been allowed to do the same. It foreshadows how often Dina grants vitality to familiar situations. When the movie’s main twist is unveiled early on – that is, Stewart is cheating on Ryan because their marriage is a sham – Dina race-walks across a hotel lobby to confront Stewart where he chats up a lady. The lady, of course, turns out to merely be Stewart’s aunt, but rather than play this for traditional egg on your face comedy, Dina rips into the aunt too, a hurricane refusing that downgrade to tropical storm. This mirrors the movie’s foremost scatological joke which Dina gives a double exclamation point free of I-Couldn’t-Help-It embarrassment and full of Just-For-The-Hell-Of-It bravado. Later, when the Flossy Posse attends Sean “Diddy” Combs’s Superdome concert and he pulls Dina up onstage, you believe it’s really happening because she makes you believe she’s capable of anything. Lisa, in fact, has some of Dina in her, which Pinkett Smith smartly plays to, often letting shades of rambunctiousness shine through her semi-shrewish exterior even before she takes the plunge and has a fling with a much younger man (Kofi Siriboe) that thankfully keeps it kinkily casual, a la “Magic Mike XXL” and its the freeing nature of love. It makes you wish that Ryan had been given more to play than a simple case of Will She? Or Won’t She? when it comes to her lifestyle, or “lifestyle”, with Stewart, while you also wish Sasha’s plight turned on more than whether or not she will use Ryan’s relationship drama to re-invigorate her gossip column and save her job. Then again, while Ryan does meet Another Guy, in the form a kindly Julian (Larenz Tate), the script does not necessarily push her into another relationship in the midst of her current one disintegrating, keeping it more loose and expressive, never more than a moment at the House of Blues where she watches Julian play in his band as his bass notes become someting like a come on. That musical undercurrent is also seen in a scene where the Flossy Posse meets Stewart’s paramour on the dance floor. And if what follows might be culled from a dozen or so dance-off films, this one remains refreshingly absent the need to resolve anything, just pulsing in the liberation of its groove. It might devolve into a fight but damn, it’s still a lovely day. Nice review here. Loved this film and loved Haddish in it. God, can you imagine if she managed to nab an Oscar nom for her work?